Rhys Daniels Trust Annual Butterfly Ball | Marbella Marbella – Adelante! 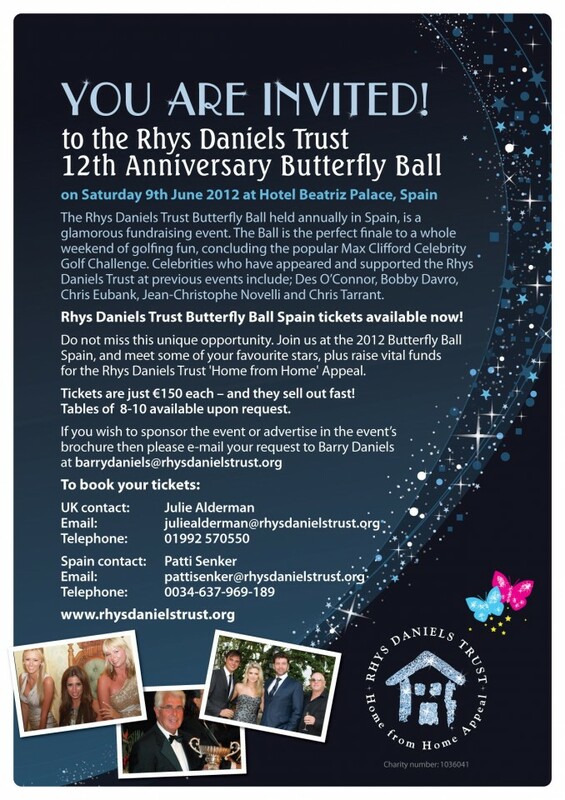 The Rhys Daniels Trust’s annual Butterfly Ball takes place this year at the beachside Hotel Beatriz Palace & Spa just outside Fuengirola on Saturday 9th June. The Rhys Daniels Trust provides free, self contained accommodation close to specialist children’s hospital in the UK for families to use whilst their desperately sick child is being treated in hospital. The Butterfly Ball in Spain is one of the Trust’s most popular fund raising events and comes at the end of the Max Clifford Celebrity Golf Challenge. Tables of 8 or 10 at the Ball are available.